AkzoNobel’s Ashington facility has reached a milestone as another part of the planned transfer of production of existing AkzoNobel sites in the UK has shifted towards the Northumberland site. The global paint specialist officially opened its state-of-the-art facility in Northumberland in September 2017. The £100 million invested in the Ashington site remains one of the largest investments AkzoNobel has ever made. The cutting-edge technologies available at the site enables AkzoNobel to produce more paint, more quickly and sustainably than ever before. Driving efficiency across the site will enable AkzoNobel Ashington to continue to increase its production volumes over time so it can be responsive to business and customer demand. Shirley Spoors, production manager at AkzoNobel Ashington, added: “This is a really exciting time for the site. The 22 new production operatives have all been trained in-house and are already working regular shift patterns. Capable of producing up to 100 million litres of paint per year in up to 33,000 different colours, AkzoNobel Ashington has been hailed as the world’s most advanced and most environmentally sustainable paint factory, using a variety of renewable energy sources to fuel its processes. 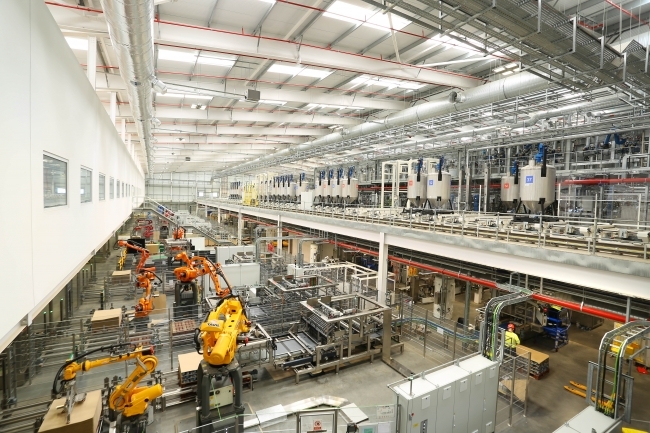 Manufacturing paints and decorative coatings for household brands such as Polycell, Cuprinol and Hammerite, the site is also the new home of AkzoNobel’s Dulux megabrand in the UK.